Non-steroidal anti-inflammatory drugs, such as aspirin, ibuprofen and other non-prescription pain relievers, may temporarily ease symptoms that have been present for a short time. Orally-administered diuretics (water pills) can decrease swelling. Corticosteroids (Prednisone) or the drug Lidocaine can be injected directly into the wrist or taken by mouth to relieve pressure on the median nerve and provide immediate temporary relief to mild or intermittent symptoms. Steroid injections can cause permanent injury to the nerve if the needle is accidentally placed in the nerve. Steroids of any kind should not be taken without a doctor’s prescription. People with diabetes or those who may be predisposed to diabetes should note that use of corticosteroids could make it difficult to regulate insulin levels. Although symptoms may be relieved immediately after surgery, full recovery from carpal tunnel surgery can take months. Some patients may have infection, nerve damage, stiffness, and pain at the scar. Occasionally the wrist loses strength because the carpal ligament is cut. Physical therapy following surgery will help restore wrist strength. It is also suggested that some patients change or adjust jobs after recovery from surgery. Acupuncture, chiropractic care, yoga, Infrared heat therapy, stretching and strengthening exercises can be helpful to people with carpal tunnel syndrome. Ultrasound and electrical stimulation has also been shown to promote recovery after nerve and tendon injuries (Michlovitz 2005). Check out our new Far Infrared therapy products. Far Infrared therapy has been available and used by therapist for some time. Now you can enjoy FIR at home or while traveling with a choice of either wired or cordless designs from Pain Relief Essentials. The Rhythm Touch 2-Way Electrical Muscle Stimulator is effective in relieving pain. 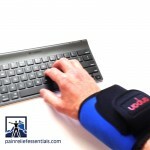 This may be associated with carpal tunnel syndrome. By stimulating the muscles, increasing the circulation, and removing blockage, the swelling that squeezes the carpal tunnel subsides. The muscle stimulation also increases the strength and reduces the possibility of muscle loss, especially in the base of the thumb. By increasing the circulation in the area where the pads are placed, it helps restore the electrical balance of the area and draws blood, oxygen, and nutrients to the area. and/or any other medical condition.